The fundamental characteristics of a ship’s design, and how they affect its behaviour at sea are of crucial importance to many people involved in the design, construction, operation, and maintenance of all marine vessels. Naval architects and those working in ship design need to understand these principles in depth. Marine engineers must likewise recognise the degree to which their activities are influenced and bounded by these principles. Finally, senior crew – both Ship’s Engineers and Commanders – need an understanding of the principles of naval architecture in order to properly fulfil their duties. This book offers a clear and concise introduction to the subject and is of great value to both students and practising professionals in all of the above fields. Students of naval architecture and marine engineering at NVQ, HND and degree level in the UK and international equivalents. Practicing and student crew working towards certificated command and engineering positions in merchant and naval sectors, in particular the UK DoT/SCOTVEC Certificate of Competency for Class 2 and Class 1 Marine Engineer Officers. Ship surveyors and related technical/engineering groups. Eric Tupper is a Fellow and Honorary Vice-President of the Royal Institution of Naval Architects (RINA), UK. 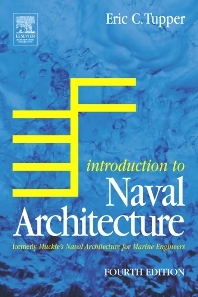 In 2011 he received the William Froude Medal for outstanding contribution to naval architecture from RINA for his Basic Ship Theory books, co-authored with Ken Rawson. His long career in naval architecture has included ship design, hydrodynamic and structural research, and ship production.